When the world wearies, and society ceases to satisfy, there is always the garden. don't forget to take time to smell the flowers this weekend! The Multiflora Roses growing down in the swamp below Ballard Park, and the breeze off the ocean wafts that wonderful smell all through the park. Believe me, I was smelling the flowers all afternoon! That is one of my sister's favorite songs. Flowers downstairs growing by leaps and bounds these days - they are overhanging the stairwell now which makes for extra nice trips for me! Wonderful shot. Just so beautiful. Childhood inoccence just jumps out. it does not get any cuter than this! How can you not love that song? 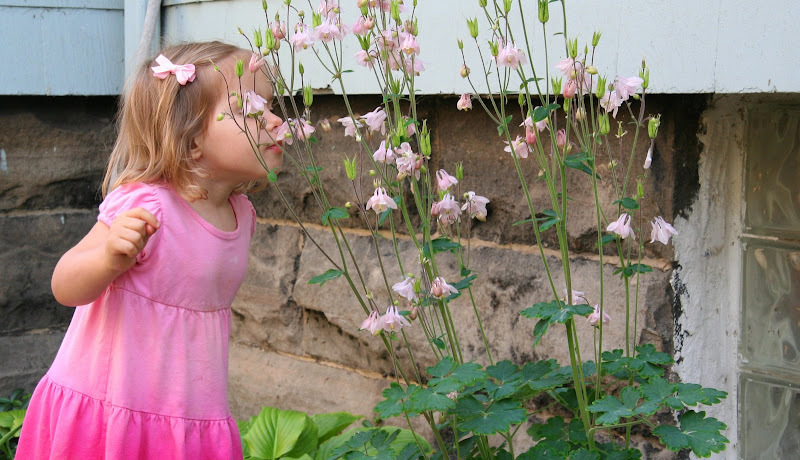 Little girl in pink smelling pink Columbine flowers. Sweet. You have a wonderful weekend too! The flower is called 'ancolie' in French but I think the English name of Columbine is prettier. With its pert little ruffled skirt, the flower does look like the Commedia dell' Arte character. The little girl is very sweet and so is the photo, kimy. I would, but the birds ate all mine! PS I was driving Princess Perfect to ballet last week and put on one of those free-with-newspaper CDs and The Foundations' Buttercup song came up. Great stuff. The quote got my attention, haven't heard that song in years, but the picture persuaded me to become a follower. Lovely blog.